Calling all you pistachio ice cream fans from around the web. This one's got your name on it. That bowl of creamy, cold, summertime deliciousness you see there is all about good-for-you pistachios pretending to be a totally unhealthy treat. And dang, they're doing an excellent job of it. Pretending, that is. Between you and I though I'll tell you a secret about this pistachio ice cream. Are you ready? It's 100% dairy-free, vegan and paleo. I'm not even joking. Not that you need to snub dairy to love this. My handsome, dairy-loving man rolls his eyes at all my dairy-free ice cream making adventures, but then digs in with abandon when they're ready. This vegan pistachio ice cream was no different. It's very rich and super creamy with a deliciously strong pistachio taste. The black pepper is subtle and gives the most interesting little zing once the chill of the ice cream has worn off. It's beautiful. I have to give a giant shout out to Savita from Chef de Home and her recipe for Black Pepper and Pistachio Ice Cream Pops for coming up with this awesome flavour combo. 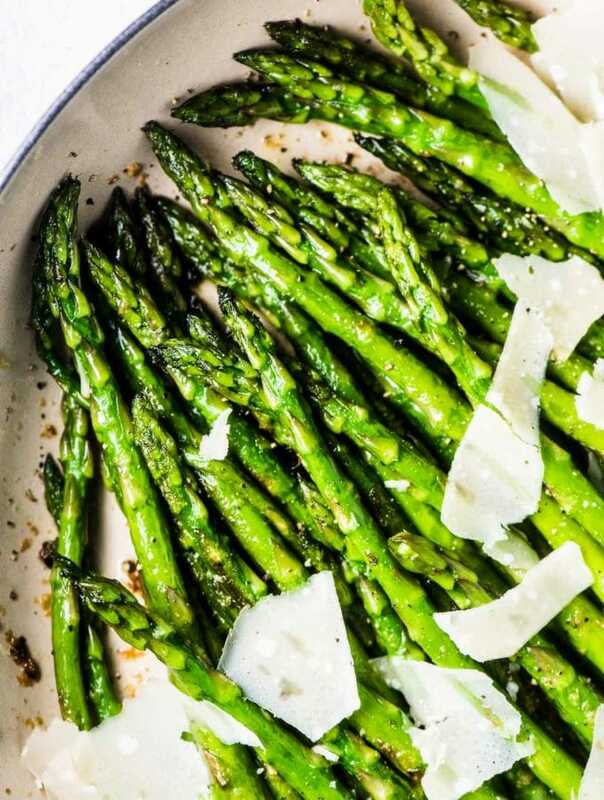 When I stumbled across her recipe a few months ago, I wanted so badly to try it. Unfortunately dairy and I don't get along so well so I knew that I'd have to veganize her recipe. Thank you so much for the brilliant combo, Savita! 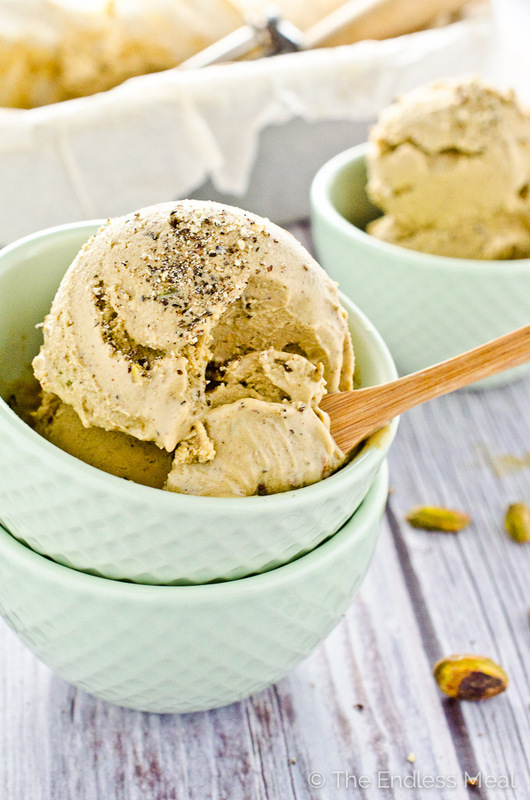 This pistachio ice cream recipe is made using pistachios that have been soaked in water overnight to soften them. They then go for a spin around in the blender with water, coconut oil (to increase the fat content and make the ice cream creamier) and some sweetener. The result is a very rich ice cream with lots of pistachio flavour. You're going to love it! 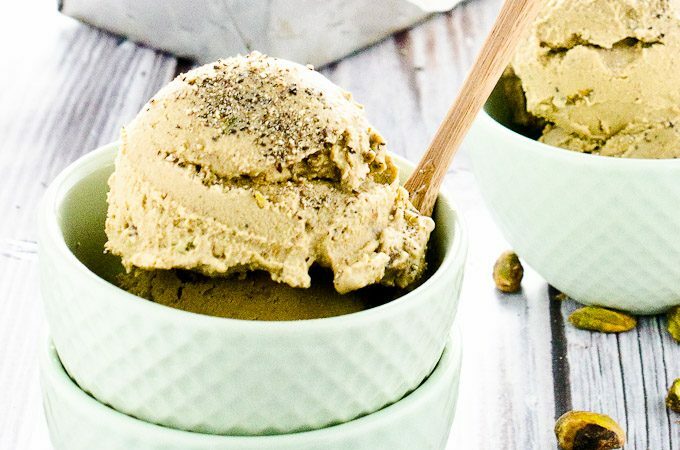 If you make this Black Pepper Pistachio Ice Cream make sure to snap a pic and tag @theendlessmeal on Instagram, so I can like and comment on your photos. I love seeing TEM recipes you guys create! 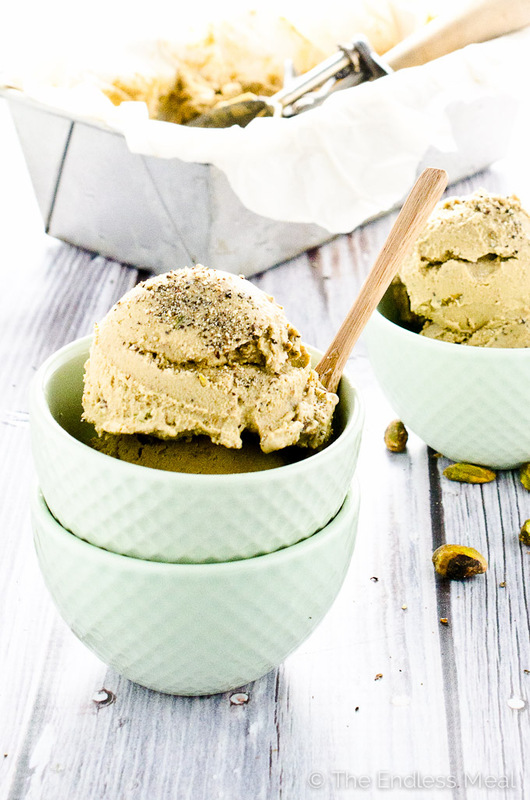 This pistachio ice cream is made with soaked pistachios for an extra delicious nutty flavour that is 100% vegan + paleo. You'll never guess it's dairy-free! Soak the pistachios in water for 4-24 hours. Refrigerate while soaking. Drain the pistachios and rinse them well. Add them to a blender or food processor with the remaining ingredients. Blend on high until smooth, 2-3 minutes. Note: if you do not have a high-powered blender you may want to strain the cream through a fine mesh sieve if there is any gritty texture. Pour the pistachio cream into a bowl and refrigerate until completely cold. 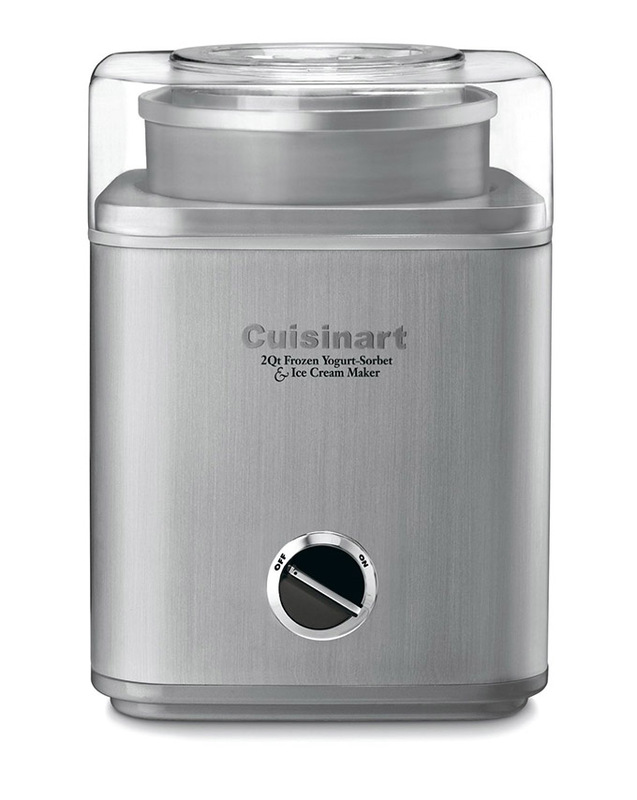 Once the cream is cold process it in your ice cream maker according to the manufacturers instructions. 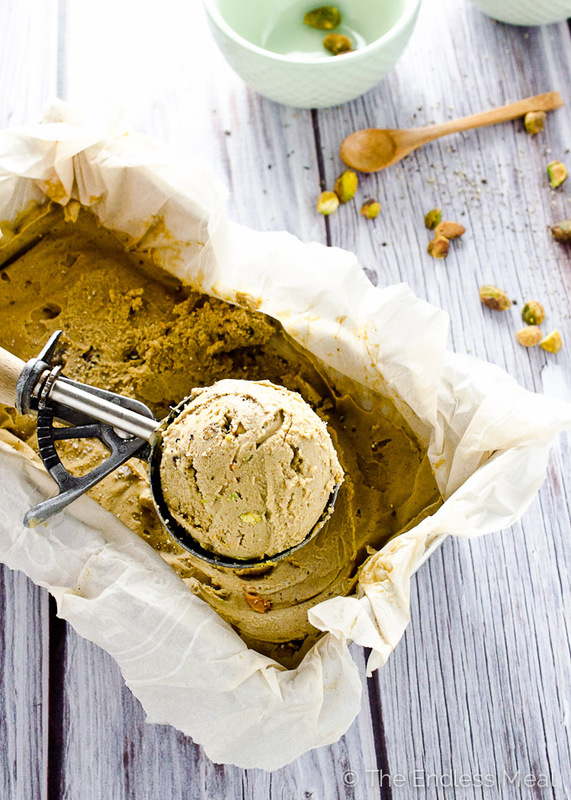 Scoop the pistachio ice cream out of your ice cream maker and into a freezer-proof container. Cover the top with parchment paper directly on the surface and freeze until firm. This looks amazing! 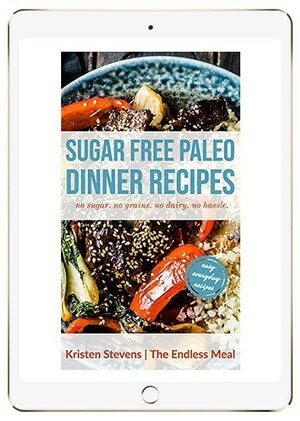 But with the addition of the cane sugar can it be considered Paleo? I would definitely try this one. Thanks a lot for sharing! Oh gosh, you are so creative! 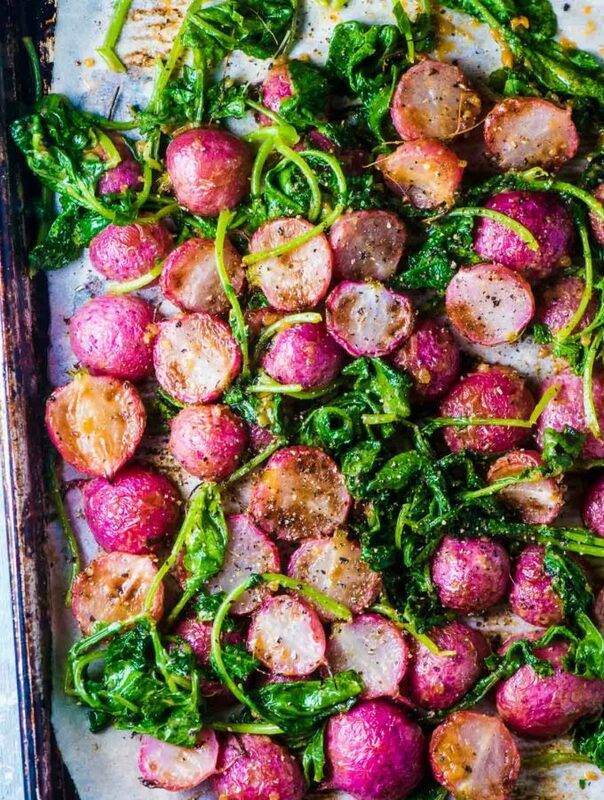 When I saw the title I really hoped it was going to be a vegan recipe, because all I wanna do is making this one tonight! You should definitely make it. It really is so good! What an incredible flavor combination! I adore anything with pistachios and ice cream is my ultimate weakness. I love that this is dairy free, it looks so creamy and delicious! What a dessert you’ve got, Kristen! To be honest, I choose dairy ice cream most of time, but I would definitely try this. Coconut milk paired with pistachios and black pepper, that couldn’t be bad at all:) Well done! Holy your fingers must have gotten so sore! Pistachios have always been one of my favourites; I even like the whole process of shelling them, but maybe not for a whole hour! Ooo, ooo, ooo… me, me, me! I love pistachio ice cream! But I’ve never made my own and I have never ever had nor would have even thought to add black pepper! This sounds so intriguing – I have to try this! Hope you have a wonderful weekend my dear. You totally should make your own! I make nut based ice creams quite often and I’m always amazed at how easy they are to make … and so much better than store-bought. Oh my goodness, Kristen! This ice cream is BEYOND fabulous! I adore pistachio anything, but mixed with ice cream and black pepper?? HEAVEN! Plus my belly totally thanks you for making this dairy free! This is an ice cream dream! Pinned! Cheers! Thank you, Cheyanne! I’ve always been a big fan of sweet and savoury flavour combos so this one totally worked for me. Thank you for the pin! Black pepper! I would have never thought to pair the two together, but this sounds amazing. Pistachio ice cream is one of my favourite flavours- I actually have a tub in my freezer right now, and the next time I have some I’m going to put some black pepper on it! It is incredible that you can use nuts to make ice cream. VERY IMPRESSIVE! And adding black pepper? Sounds interesting! Sharing right now. When I first found out that you can use nuts to make ice cream I was pretty skeptical, but they totally work! I don’t think I’d ever go back to making ice cream any other way. Thank you for sharing!